Membrane bioreactors (MBR) are systems that are highly effective in removal of organic, inorganic and biological contaminants from a wastewater stream. 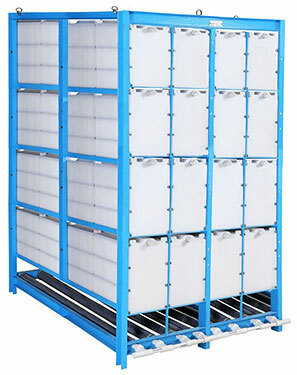 The system combines membrane filtration with a bioreactor as the title suggests. The system utilizes membranes submerged in the bioreactor with coarse bubble aeration to produce the mixing and reduce fouling. The process differs from a traditional wastewater treatment plant in that separation is not done by sedimentation in a secondary clarification tank but instead by membrane filtration. MBR systems require a smaller footprint as compared to similar technologies and are a natural fit for industrial wastewater treatment. Membrane filtration is an enhanced form of filtration that can separate dissolved solids in wastewater. Pressure driven membrane processes from Micro-Filtration (MF) to Reverse Osmosis (RO) are specified with the respective pore size. Micro-Filtration (MF) can handle removal of particulate or suspended solids ranging in size from 0.1 to 10 microns (μm). Ultra-Filtration (UF) is able to recover macro-molecules in the 0.01 to 0.1 μm range. Nano-Filtration (NF) can achieve removal of particulate 0.001 to 0.01 μm. Reverse Osmosis (RO) membranes are capable of separating materials less than 0.001 μm. MF and UF membranes require pressure generally in the 0.1 – 10 bar range. RO operation requires very high pressure up to 150 bar. The MF or UF membrane is a device that allows the passage of certain components, but rejects others above a particular size or weight. The separation process generates two streams, the permeate (liquid) stream which has passed through the membrane or the clean stream. The other is the concentrate or polluted stream. The permeate can be discharged usually after biological treatment. Cleaning of the membrane is accomplished by frequent permeate back pulsing and occasional chemical backwashing. A diffuser is usually placed directly beneath the membrane module to facilitate scouring of the filtration surface. Anoxic or anaerobic compartments can be incorporated to enable simultaneous biological nutrient removal. Industrial wastewater streams typically contain high organic loadings in addition to specific, usually difficult to treat, compounds. The table below shows results achievable on a variety of industries.